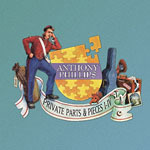 Share the post "Album review: ANTHONY PHILLIPS – Private Parts & Pieces I-IV, Wise After The Event, Sides (reissues)"
Following on from the initial compilation and ‘The Geese & The Ghost’, Esoteric do Anthony Phillips proud with a further series of reissues and including bonus discs featuring new stereo and 5.1 remixes. This might lead to a personal debate as to whether now is the time to upgrade your audio system. Private Parts & Pieces was a series that Phillips’ started in 1978 and was essentially his opportunity to collect together various demos and pieces recorded since the early 1970s, a project that ran in parallel to his more “commercial” offerings via the Arista and RCA label (more about which later). The earliest pieces on the seminal album dates from 1969, and reflect his early acoustic excursions with Mike Rutherford and a strong Genesis connection throughout. A demo version of ‘Silver Song’ is included, a piece that was originally intended as a tribute to one-time Genesis drummer John Silver. Privates Parts & Pieces II: Back To The Pavilion was released in 1980 and is less “demo” than its predecessor and more coherent. It includes music written for an educational version of ‘Macbeth’ and a formative take on ‘Wise After The Event’, the second mainstream album Phillips album released in 1978. In 1982 Phillips released the third album Antiques with the Argentinian guitarist Enrique Berro Garcia. This album was a new project and marked Ant’s first formal joint collaboration on album with another artist. (He would work with another Argentinian guitarist, Guillermo Cazenave, in 1996). An album of easy on the ear guitar duets, this reissue is expanded with seven bonus tracks (alternate mixes or variations) including the later duet ‘El Cid’. This album includes some of the last recordings at Phillips’ childhood home/studio Send Barns. A Catch At The Tables (1984) included a suite of pieces originally composed for a friends’ wedding in 1980 and now dubbed ‘Arboretum Suite’. The real treat for fans in this deluxe clamshell box set is the fifth disc which includes previously unreleased tracks and alternate versions such as ‘Sea Piece’, an instrumental from the ‘Sides’ sessions, his third mainstream solo album. If ‘Private Parts’ was an outlet for Phillips’ more, er, esoteric offerings, there was still the more conventional major record label route, at least in the 1970s. Following 1977′s ‘The Geese & The Ghost’ Ant signed to Arista and released two more albums before the label realised that he would always remain a niche/uncommercial artist. For fans, the chief attraction of the 4-disc Wise After The Event box set is the 5.1 mix. The bonus disc of “demos, outtakes and extras” was available on the 2008 Voiceprint reissue although several tracks have been remixed for this version. Jonathan Dunn’s essay, and the track annotations, are also reproduced from the earlier Voiceprint release but the updated version includes the nice touch of a poster/lyric sheet. 1979′s Sides more fully developed the commercial side of Phillips’ work and again at the behest of the record label. It remains his “poppiest” work and if somewhat unrepresentative of his output as a whole, it perfectly reflects the pop aspirations of the age and was again produced by Rupert Hine (Howard Jones, Stevie Nicks, Rush). 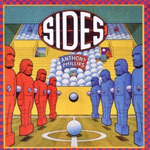 However not even a promotional event with sports commentating legend Eddie Waring (reflecting the table football theme of its cover) could save ‘Sides’ and the album marked his last for Arista. These releases reflect the frightening productivity of Anthony Phillips and – to be frank – only really touch on his work over a 40 year-plus period that has been well documented on the initial Esoteric anthology to launch the reissues. The inquisitive will want to seek out his library/TV music in ‘The Missing Links’ series which illustrates another facet of Phillips’ prodigious output. This continuing reissue campaign is a sumptuous feast for early-Genesis lovers, reconstructed Phillips fans, and those who seek a body of music that is beguiling and unashamedly romantic in equal measure and redolent of a gentler – very English – past from a performer who could well be the Vaughan Williams of his peers. This entry was posted in ALBUM REVIEWS, ALBUM REVIEWS (Mobile), All Posts, Reissues and tagged 5.1, acoustic, album, Anthony Phillips, deluxe edition, Genesis, interview, pop, Private Parts & Pieces I-IV, progressive, reissue, review, rock, Rupert Hine, Sides, Wise After The Event. Bookmark the permalink.